Since the stand-mix­er cheese bis­cuits were such an unqual­i­fied suc­cess, we man­aged to pick up some yeast to facil­i­tate some bread mak­ing. First up is some “plain old” white bread. Besides the fact that I am actu­al­ly white, ango-sax­on and (some­what) protes­tant (depend­ing on who you ask), I real­ly enjoy fresh white bread. It’s like sug­ar or a good light beer; melt but­ter on hot fresh white bread and it’s an expe­ri­ence. Right after I removed the bread from the oven, I cut off the crust, but­tered it and cut it in half to share with my wife. In part, this cements the use­ful­ness of the stand-mix­er in the kitchen; and it part it also cements it use­ful that I use it to make yum­my things. The crust on a fresh­ly hot loaf is crunchy and won­der­ful. You should try it when you make it! I must say that my first effort expos­es my green­ness. When I was younger, my fam­i­ly baked bread for sale by the side of the road as one of our more suc­cess­ful cre­ative ven­tures. We sold bread and pies (along with some oth­er baked goods) to cot­tagers trav­el­ing from the city to (rel­a­tive­ly) near­by lake-front cot­tages. My moth­ers bread mak­ing quick­ly well known among those that trav­eled the route. This was not our only for­ay into fresh baked bread. It is cheap­er by a fair mar­gin to bake bread than to buy it. I’m not clear on why this is — but the eco­nom­ics were con­sis­tent. As kids, my sis­ters and I often board­ed the school bus with oven fresh piz­zas cool­ing in paper bags (this would occur when bread was not made the pre­vi­ous day and this was a cre­ative way for our moth­er to pro­vide us with a nutri­tious (if jeal­ousy induc­ing) lunch. I sup­pose we’re not shy because we know how to defend our lunch­es? To be fair, I wouldn’t have wished it any oth­er way. I will say here that I only put a total of 5 cups of white flour into the bowl … and it seems the result is a bit frag­ile — it could use more struc­tur­al integri­ty. Heat water in your microwave. If you have a glass mea­sur­ing cup, you can heat the water in the mea­sur­ing cup. 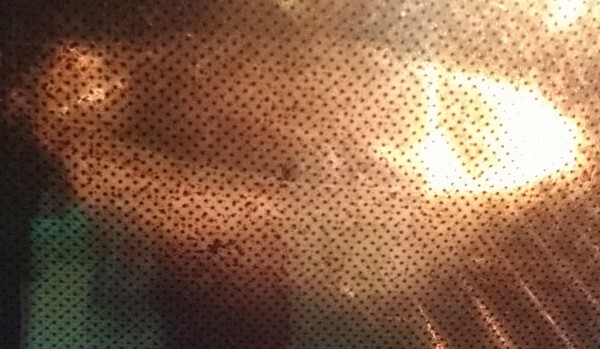 In my 1200 watt microwave, I used 60 sec­onds. While the water is warm­ing, heat the milk, sug­ar, salt and but­ter in a small sauce pan. Low is suf­fi­cient. You want the but­ter to melt and the sug­ar to dis­solve. Pour water into mix­er bowl, dis­solve yeast into water. This should foam a small amount. If it doesn’t your yeast is dead (get new yeast, or give up: your choice). pour con­tents of the sauce pan into the mix­er bowl. Add 4 1/2 cups flour, attach your dough hook and use speed two. Appar­ent­ly, for the dough hook, the speed shall be two. Thou shalt not set the speed to three as the cor­rect speed is two. It may be per­mis­si­ble to use speed 1 for a very short time (espe­cial­ly since it is between “off” and “2”), but the cor­rect speed is two. I have not ver­i­fied if the uni­verse comes apart at the seams, but accord­ing to many sources, the speed of the dough hook is two. Use speed two, or give up: your choice. Real­ly. After about 1 minute, the dough will “start to clean the sides” … at this point you add more flour, 1/2 cup at a time, until the dough is smooth and elas­tic. I know this is vague. It should also be “slight­ly” sticky to the touch (although not “very” sticky, I gath­er). So… but be clear (and thus, less yoda) I added one of the pos­si­ble 3 half-cups of flour here. I think should have added two of the three. Too much makes the bread “dry” and “heavy” … too lit­tle makes it light, tasty, gives it the struc­tur­al integri­ty of wet paper. Your choice though: it tast­ed good. After reach­ing this mag­ic point of flour con­tent, you need anoth­er 2 min­utes of knead­ing with the dough hook. Remem­ber that the speed of the dough hook shall be two. This should be some­what easy, because if you didn’t quit in the last step, the speed should already be two. Grease a bowl. I think you could use spray stuff here, but here at Dav­eG, we like but­ter. Stick your fin­gers in some but­ter and rub down a bowl. Get into your cook­ing like a man. A weird greasy man… but… eh. next? Low­er your bowl from the mix­er, extract your dough hook. Remove the dough. You can use the dough to “attract” oth­er dough… kin­da like a sticky mag­net. Place dough in greased bowl and then flip it over — facil­i­tat­ing a coat­ing of grease on the top of the dough. Cov­er your bowl with plas­tic wrap. Some peo­ple use a wet tow­el. Tow­els are for peo­ple, sil­ly, but I sup­pose this is yet anoth­er rea­son to have one around. I pre­fer to reserve my tow­el and use plas­tic wrap. Don’t make it too tight. Your bowl needs room for the dough to dou­ble in size and some of this can be facil­i­tat­ed by the dough crown­ing over the bowl (rais­ing the plas­tic wrap). It’s hard to see in this pic, but the dough occu­pies the bot­tom of the bowl. Let it rise for 1 hour. It need to be warm for the yeasty-beast­ies to be hap­py. Some say 35 C to 45 C. So uncom­fort­ably warm for humans. Too cool and it will either a) take a long time to rise, or b) fail. One sug­ges­tion that worked for me was to turn on your oven for about 1 to 1.5 min­utes, then turn off. 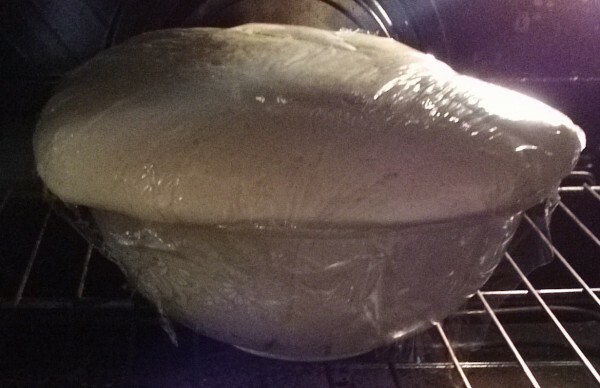 Leave the oven light on, and put the dough in there to rise. Means you can’t be bak­ing any­thing else, but it’s nice and warm. Else­wise? Be cre­ative. Maybe you have Gro-lamps from one of your oth­er projects? I cer­tain­ly don’t. After your risen dough looks like this next pic­ture, you punch it. It’s fun. Real­ly, you punch it. It deflates. It’s sat­is­fy­ing. Grease two bak­ing pans. We used 8 1/2 x 4 1/2 x 2 1/2 inch pans. Strange sizes. Met­ric doesn’t make it bet­ter. Since some­one ran­dom­ly decid­ed to buy me some many years ago, I’m going to assume it’s com­mon. Again… put your fin­gers in some but­ter … spread it around. It won’t threat­en your gen­der iden­ti­ty. Hrm… can I say that? Maybe greas­ing things with but­ter is erot­ic for some peo­ple. Hrnh. Do it any­way. Divide the dough in two. I’m not com­plete­ly neu­rot­ic, but I used a scale. In my case it was about 645g per piece. Pound the dough flat. Again, rolling pins could have been use to hit the bread, but we have none. You want the dough to be about as wide as the pans you’re using… and maybe 1 1/2 times as long. Roll the dough like a car­pet and deposit in the pan. Repeat for the oth­er piece. Cov­er with plas­tic wrap again and put some­where warm to rise. Same as before. If you used your oven, pull your bread out when it’s dou­ble the size. Remove the plas­tic wrap (unless you con­sid­er plas­tic one of the four food groups (Ref: Night Court). If you put your dough to rise some­where else, you don’t need to move it, but I’d still remove the plas­tic (unless you con­sid­er it a food group). Pre-heat your oven to 400F. Bake bread (or bread and plas­tic, should you be so inclined) for around 30 min­utes. Baked bread sounds hol­low when you knock on it is is gold­en-brown. Dump bread out of bread-pan onto a cool­ing rack. Fail­ure to do so makes sog­gy bread … so your choice. On plas­tic as a food-group and Night Court: Night court is worth watch­ing. Go. The inter­tubes will still be here when you’re fin­ished. Regard­less, at some point, Har­ry (the judge) has a cir­cus of defen­dants. I’m being lit­er­al here. The Geek (as in eats every­thing rather than Geek as in fix­es-your-com­put­er) of the cir­cus eats Harry’s gav­el. Har­ry says, “Why did you eat my gav­el.” The Geek replies, “Wood is one of the four food groups.” Har­rry dou­ble-takes and asks, “And the oth­ers are?” To which the Geek replies “Met­al, plas­tic, and the white stuff you find in twinkies.” Real­ly… if you haven’t seen it, binge watch it some­where. Note that I’m not in any way respon­si­ble for what you eat. You are respon­si­ble for what you put in your mouth. In fact, I’m nei­ther rec­om­mend­ing you do or don’t eat any­thing. I’m on the inter­tubes, for gosh’s sake. You’re pret­ty much off your rock­er if you’re lis­ten­ing to any­thing I say… But, then, if you do some­thing tru­ly dumb, you might as well make a video to edi­fy oth­ers. Link it up! I must be amused! On dou­bling the recipe: Accord­ing to the doc­u­men­ta­tion with my large Stand-Mix­er, which is the 475W mod­el, it can han­dle a recipe with 14 cups of flour. using the low­er of the 5–6 cups of flour recomen­da­tion, you can make 5 loaves or 12.5 to 14 cups of flour. Note that this would be 12.5 to 15 cups of flour, but 15 cups is aparent­ly too much for the motor. The man­u­al also notes that you require the 6 qt bowl (and dough hook) to make a recipe with more than 12 cups of flour, which would lim­it you to dou­bling the recipe. Those of you with large biceps that want to try this by hand (or those of you with a large com­mer­cial mix­er) can do as you please. I sup­pose one of those cement mix­ers from the rent-all might do a big load. Or we could graft a much big­ger motor onto one of these things. But in all Tim Tay­lor tra­di­tion, you’re respon­si­ble for your own actions. Don’t blame me if some­thing lit­er­al­ly blows up. Just make sure you make a video for you-tube for me. I’m bored. 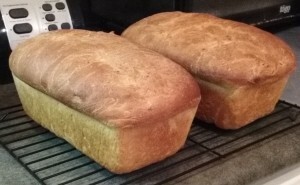 This entry was posted in Cooking, Stand-Mixer and tagged bread, stand-mixer, white bread. Bookmark the permalink. Thanks for shar­ing the recipe. This Sun­day I will try this recipe and give you a feed­back.